So many elite conservatives are lamenting the current embrace of anti-foreigner populism over intellectual conservatism. A recent example is Matt Lewis' Too Dumb to Fail. His message seems to be that we need to sell smart conservatism to the masses who are inclined to be stupid. But look at the above map. 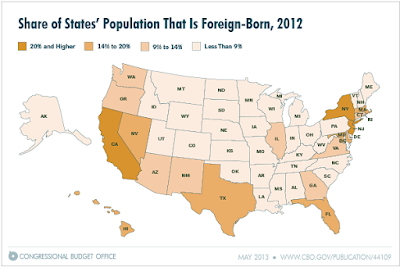 Five important states--Texas, Florida, Virginia, Arizona, and Nevada--have large foreign-born populations, and I showed previously that our current foreign-born are typically non-white, and some are non-Christian. And those folks and their descendants do not vote Republican. And they never will vote majority Republican.